A house fire, sparked by faulty Christmas tree lights, envelopes a living room in a shocking 46 seconds. Take this opportunity to check that your Christmas tree lights are in good condition, turn them off before you go to bed and especially keep your tree well watered. The following video is actual real footage from testing. It is not altered in anyway. One of every three home Christmas tree fires are caused by electrical problems. Questionable lights, ones that blink or maybe do night light? Damaged cords, plugs? Just toss them and play it safe!!! Although Christmas tree fires are not common, when they do occur, they are more likely to be serious. On average, one of every 40 reported home structure Christmas tree fires results in a death compared to an average of one death per 142 total reported home structure fires. Make sure your smoke detectors are less than 10 years old and have a fresh battery!!! 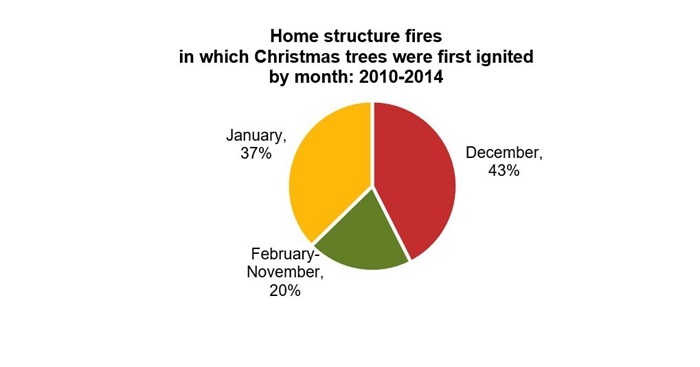 A heat source too close to the tree causes roughly one in every six of Christmas tree fires. KEEP HEAT SOURCES AWAY!!! they may not be hot enough to ignite the tree, but it will dry the tree and make it highly flammable. More than half (56%) of home candle fires occur when something that can catch on fire is too close to the candle. Keep a safe distance of any items, away from the candle. December is the peak time of year for home candle fires. In December, 11% of home candle fires began with decorations compared to 4% the rest of the year. Make sure you put all candles out before you go to bed and before you leave. NEVER LEAVE A BURNING CANDLE UNATTENDED!! !